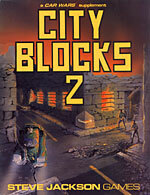 It's Car Wars City Blocks 2 – fully compatible with the original City Blocks. Life in 2038 can be downright ugly and dangerous. Give your duellists the thrill of blasting through the less glamorous parts of town . . . where crazies lurk around every corner. Where disaster waits for the unwary and the next street could be your last. Can you make it through the rubble unscathed? Or will you become just another AADA statistic? Add challenge to your life; just cross the river . . . This suppplement contains 32 city blocks; extra craters, oil slicks, and smoke counters; and additional road sections and waterways.